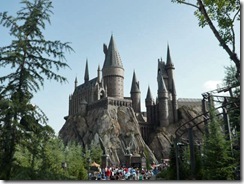 The Harry Potter theme park sets a new standard for amusement park attractions, drawing record numbers to Universal Studios Florida. Visitors to the Wizarding World of Harry Potter will discover all the magical places they’ve come to know and love in the book and movie series, but they’ll also find packed crowds and wait times of up to two hours for the most popular rides. Don’t let the muggle mobs deter you from this extraordinary adventure! 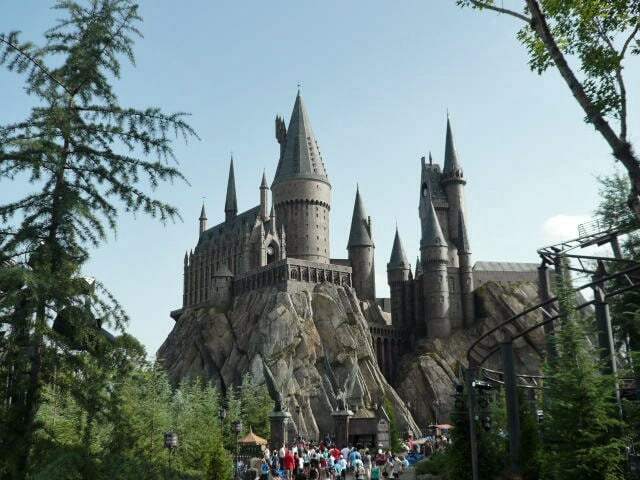 On a recent sweltering Florida weekday, with temperatures nearly into the triple digits, we ventured in to see if the Harry Potter attraction was worth all the hype. It was hot, crowded, and loud. And yes, it was worth it. My jaded teen, a veteran of the scariest roller coasters, deemed the Forbidden Journey “THE BEST RIDE EVER!” Her tween brother vowed to read all the books as soon as he returns home. Both begged for another Harry Potter movie marathon. Age Level – Although the Wizarding World is compelling for those familiar with the book or movie series, you don’t have to be a Harry Potter buff to enjoy the attraction. Children (and adults) of all ages will get a kick out of exploring the magical settings, and there are rides for both the under and over 48″ crowd. While the Dragon Challenge roller coaster is only for the above 48″ crowd, the milder Flight of the Hippogriff roller coaster can be enjoyed by all. The most sought after attraction in the Wizarding World is the Forbidden Journey, which takes you on a tour through Hogwarts School of Witchcraft and Wizardry before depositing you at the ride. This exhilarating, total immersion ride through the monster-ridden school halls is not for the faint of heart, or those under 48″; however, you can always skip the ride at the end of the tour. Dress For Success – When dressing for a day at the amusement park, think marathon runner. Shock-absorbing sneakers are essential when standing on long lines, and fast drying fabrics are helpful when going through fog machines, misters, or water rides. Sun protection is critical in Florida, especially if you’re unaccustomed to the strong rays. We slathered on waterproof, high SPF sunscreen before leaving the car, and carried a small tube for reapplying later. My daughter and I wore sunglasses, and I purchased a pair for my son who promptly lost them it in record time. Hats are also advisable, but we just made it a point to travel in the shade as much as possible. Pack Light – You may be tempted to bring all kinds of essentials, but keep in mind that on many rides you won’t be allowed to carry loose items or bags. Lockers are provided, for a fee, throughout the park, but who wants to waste time looking for an available locker? One advantage of traveling with older children is that, unlike the days when I had to haul a diaper bag with snacks and sundries, nowadays the only items I carry to an amusement park are: a point and shoot camera and a Neck Wallet containing cash, ID, chapstick, and a mini-sized sunscreen. Hydrate Often – Given the limitation on carry on items, holding onto a drink container can be tricky. 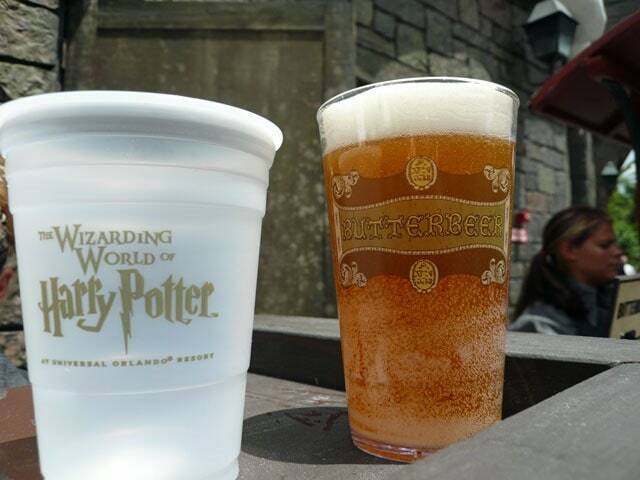 Fortunately, many rides such as the Forbidden Journey provide water fountains, or you can spring for a drink when you get off a ride and finish it before the next. Consider bringing a Platypus Softbottle that can be refilled as needed, or folded flat when it’s time to get on a ride. Arrive Late – There is no advantage to arriving early; in fact, some visitors contend that lines in the Wizarding World diminish considerably later in the day. On our mid-July weekday visit, we didn’t see any visible reduction. The lines were just as long at 7:30 PM as they were at 2 PM! Still, a full day at any amusement park can be exhausting, so I recommend going with your natural inclinations. I prefer to start late, and go nearly until closing, but a morning person might prefer a different schedule. The key to enjoying the experience is to realize that you can’t do everything, so choose wisely. Timing – Universal’s Islands of Adventure is laid out like an oval donut around a large pond, with the Wizarding World placed on the opposite side from the entrance. When you enter the park, you can turn left or right and eventually circle to the Harry Potter section. With older children, we chose to head left so that we could take in some of the more thrilling park rides first. Between noon and 2PM, we managed to take in three rides: the Incredible Hulk Coaster, the Spider-Man 3D Ride, and the Jurassic Park River Adventure. All of these posted 45 minute to 1 hour wait times, but as we were willing to split up our group to get into the Single Rider line, we bypassed much of this. We could’ve gone on even more rides, but we finally, after years of fruitless requests, fulfilled my daughter’s wish to get a hair wrap. 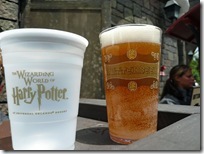 Wizarding World –Plan on spending the bulk of your day at this attraction if you want to see and do everything. Enter – At 2PM, we crossed into the Wizarding World from Jurassic Park. Butterbeer– At either entrance, you’ll find carts selling Butterbeer, a popular wizarding in the Harry Potter books that tastes like a cross between butterscotch and cream soda, and is available as a soda or slushie. We conducted a taste test of both to confirm that the frozen version is the yummier choice! Forbidden Journey – Carrying our drinks, we went directly to what we thought was the end of the Forbidden Journey line, not realizing that this was actually for the lockers. Most of the people in line didn’t realize this either, so it might have been awkward to walk past them to the real line inside the building. Indoors, you can skip the tour to join the much shorter Single Rider line, but we didn’t want to miss seeing the interior of Hogwarts. And there is so much to take in, as well as many hidden secrets and variations, that it’s worth letting people pass so that you can fully appreciate all the effects. Filches Emporium of Confiscated Goods– One of my pet peeves is being forced to exit an attraction through a souvenir shop so I just made a beeline for the door and didn’t see much of the wares. Three Broomsticks– Nearly 4PM, we had worked up quite an appetite by the time we left the Forbidden Journey, so we headed over to the Three Broomsticks, an extremely well-run cafeteria that looks like an old English Tavern. We were soon at the front of the line where a hostess assigned us our number, and the system of dedicated cashier and server soon had us moving on with our filled trays to where another host led us to our table. The food was hearty and filling, and I highly recommend the combination of fish and chips washed down by Hogs Head ale. 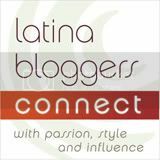 Moaning Myrtle– Even a visit to the bathroom is entertaining! The Girls’ Room of the Public Convenience located next to the Hog’s Head Pub is enlivened by the sounds of Moaning Myrtle. 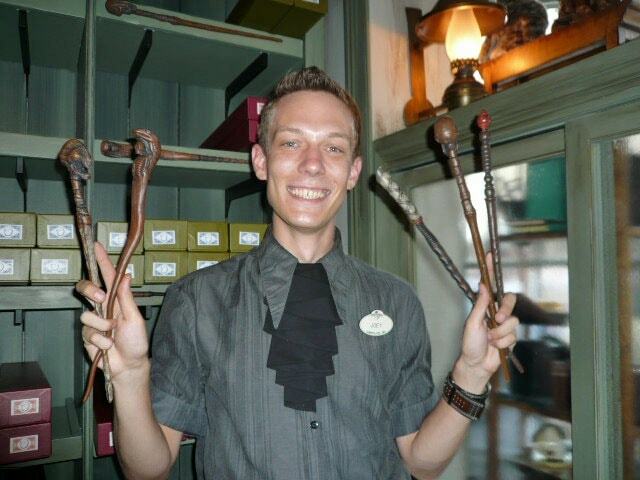 Olivanders – After our early dinner, we carried our drinks with us as we joined the queue for Olivanders, the wand shoppe. This turned out to be the longest line, but with our drinks in hand and street entertainment that included a frog chorus and ribbon waving girls from the Beauxbatons Academy of Magic, it was tolerable. Inside, the store is filled to the rafters with wand-filled boxes, and spectators watch as one young boy, selected from each new group that enters every 10 minutes, is outfitted with a wand that can be purchased afterwards in the connected store, Dervish and Banges, for merely $30. We passed on the shopping and headed out to the rest of the rides. Dragon Challenge– The line for this ride was fairly short, just 20 minutes, but it’s only for the fearless (who are over 48″.) Every rider can choose from two dragons, each a different roller coaster, that zoom and twist, nearly colliding as they come within 18 inches of each other on multiple occasions. When it was over, my kids wanted to repeat the ride on the other dragon but my stomach had had enough. Flight of the Hippogriff– With no Single Rider option, we had to wait the full 45 minutes for this ride but as with the rest of the Wizarding World, the wait is part of the attraction. In this case, you pass Hagrid’s hut where somehow we missed his instructions for properly approaching a hippogriff, but it was a great photo stop. Later, my kids complained about the tame ride, but I thought it was a delightful with a splendid view of the park. 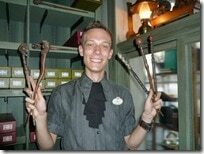 At The End of The Day– Departing the Wizarding World, we still had two and a half hours until closing time but I was ready to call it a night. The kids selected our last rides of the night, The Cat In The Hat and a return engagement on The Incredible Hulk Coaster, and we left Islands of Adventure by 9PM. Again, was the Harry Potter experience worth the expense and effort? Definitely! For one day, we entered a magical world where I was as much of a kid as my children. We laughed and screamed, and just enjoyed playing together. It doesn’t get any better than that! Glad you liked it! And I highly recommend the Seuss section for little (and big!) kids. The One Fish, Two Fish ride has always been my daughter’s favorite, even over Disney rides. Forbidden Journey,she can do the walk though BUT not the Ride.She will love the walk though she’s read all the books and saw all the Movies THANK AGAIN! Will Hoffmans Playland Go the Way of America's Lost Amusement Parks?